ASHEVILLE NC – The Friends of the Swannanoa Library and the Swannanoa Community Council present the 11th annual Groovin’ on Grovemont summer concert series in Grovemont Square adjacent to the Swannanoa Library. These shows are free of charge and the last one will be held on Tuesday, July 30 at 5 p.m.
Bring a blanket or lawn chair and enjoy these family-friendly evenings of great music! Concessions including hot dogs, pizza, home-baked goods and ice cream will be available for sale with proceeds benefiting the Friends of the Swannanoa Library and the Swannanoa Emergency Assistance Program. Admission to Groovin’ on Grovemont is free, but donations are always welcome. Individual and business sponsorship opportunities are available. Bonus feature: GIANT HALF-PRICE BOOK SALE at the Swannanoa Library during each Groovin’ concert. Thousands of great books at unbelievably low prices and all proceeds benefit the library. Tuesday, July 30 at 5 p.m. The ‘Groovemont’ Players (at 6 p.m.) – Rock, soul, blues, country and beyond! ASHEVILLE NC – On Tuesday, July 11, 2013, Asheville City Council held a special meeting to consider a matter relating to an employee of the City. Council went into closed session to receive a final report on the investigation of a complaint, charge, or grievance against an individual public officer or employee. City Council reconvened in open session where a resolution was passed authorizing the City Manager to disclose certain personnel information surrounding an administrative investigation, in accordance with general statutes, as it was deemed essential to maintaining public confidence in City services, in particular the services provided by the Police Department. Video of the special meeting held Tuesday, July 11, 2013. Resolution and Exhibit passed by City Council authorizing City Manager Gary Jackson to disclose certain personnel information surrounding the administrative investigation into the written allegations made by a Lt. of the Asheville Police Department. ASHEVILLE NC – UNC Asheville has been named a “Best Buy” in the Fiske Guide to Colleges 2014, joining UNC-Chapel Hill as the only North Carolina schools among the 21 public universities to earn a place on this national rankings list. Elon and Warren Wilson are listed among Fiske’s 20 Best Buy private colleges and universities. For the 10th consecutive year, UNC Asheville’s Environmental Studies Program was named to the Fiske guide’s list of pre-professional programs with unusual strength in preparing students for careers. The 2014 edition, released July 2, represents the 30th anniversary of the Fiske guide, created by former New York Times education editor, Edward B. Fiske. To achieve a place on the Best Buy list, a school must have a four- or five-star academic rating and be rated as either inexpensive or moderately priced. UNC Asheville is described by the Fiske guide as “one of the best educational bargains in the country,” with “all the ingredients for a superior college experience … strong academics, dedicated professors and an administration that continues to push for excellence. It’s a place to get the kind of liberal arts education usually associated with private colleges,” according to the Fiske guide. Earlier this year, UNC Asheville was named a “Best Value” by The Princeton Review, and was praised for quality and value by Kiplinger’s Personal Finance and Forbes magazine. Last September, UNC Asheville was ranked seventh in the nation among public liberal arts colleges by U.S. News & World Report, which also listed the university among those where students graduate with the least amount of debt. For more information, visit http://www.unca.edu/about/facts-and-figures/rankings. ASHEVILLE NC – Beans are back in Western North Carolina after taking the winter and spring seasons off. And, they’re a big deal around these parts. It’s been asserted that more heirloom beans, including the well-loved greasy, originated in WNC than anywhere else in the country. Varieties old and new of bush beans, pole beans, fresh shell beans, and dry beans all get ASAP’s Get Local spotlight this month. Appalachian Grown partner restaurants are excited to give beans a starring role that often goes to berries or the first tomatoes in July. The Junction’s early summer menu highlights braised local October beans with cauliflower, preserved lemon and capers, and root vegetable demi-glace alongside sweet-tea brined chicken. Also find a Hoppin’ John salad with a local lima bean twist to accompany grilled sirloin tip complete with a balsamic reduction, crispy avocado, roasted cherry tomatoes, and a bourbon barbeque glaze. The Market Place is whipping up a local seasonal special of wood-grilled pork shoulder served with a butter bean and kale ragout and a strawberry relish. Neo Burrito’s locations are serving up the option of a local bison sausage and summer veggie burrito or tacos accompanied by a local green bean and bacon salad. Of course, area tailgates will be brimming with farm-fresh beans. What’s more, July is just the exciting start of the season, and many beans will stick around through summer and into fall. But don’t just look to farmers to buy beans. Like area chefs, artisan food producers are showing beans love now, too. Copper Pot & Wooden Spoon uses just-picked local green beans to produce their famous Dilly Beans with Pickled Peppers—they were featured in Garden and Gun magazine’s 2012 Made in the South Awards. Find Copper Pot at Haywood’s Historic Farmers Market in Waynesville. To browse more Appalachian Grown partner restaurants serving, as well as groceries and roadside stands selling, local beans now, visit ASAP’s online Local Food Guide. There, also browse Appalachian Grown certified farms growing beans this year. Search by dry, green, pole, shell, and soy. ASHEVILLE NC – The Mountain Dance and Folk Festival, the country’s longest running folk festival, now in its 86th year of highlighting mountain culture, returns to the Diana Wortham Theatre this summer. The Festival runs for three full evenings, Thursday, August 1 through Saturday, August 3 at the Diana Wortham Theatre in downtown Asheville. Tickets are on sale now. Held 7:00p.m. nightly, the festival formally showcases an amazing repertoire of mountain performers – old-timers as well as the newest generation of bluegrass and mountain string bands, ballad singers, big circle mountain dancers and cloggers – who share music and dance that echo centuries of Scottish, English, Irish, Cherokee and African heritage. The festival begins Thursday, August 1 with Hometown Appreciation Night. In keeping with the grassroots flavor of the festival, local families and individuals are encouraged to attend to help kick off the first night of the festival. Audiences at each of the three performances will see an extensive line-up of the best musicians, ballad singers and dancers; each evening features at least four dance teams from the very young to the young at heart. The popular and long-standing house band the Stoney Creek Boys returns to perform each evening. And each night of the festival features both well-known musicians and new talent alike, representative of the Southern Appalachian Mountains and its continuing traditions. • Thursday, August 1: Carol Rifkin and Jerry Sutton, Masters of Ceremonies; Ed Herron; Grey Eagle (Stoney Creek Boys); Betty Smith; Crooked Pine; Dance Team: Southern Appalachian Cloggers; Buncombe Turnpike; Peg Twisters; Dance Team: Folk Heritage Smooth Dancers; Dance Team: Southern Mountain Smoke; Don Pedi; Paul’s Creek Band; Brooke & George Buckner; Dance Team: Dixie Darlins; Whitewater Bluegrass Company. • Friday, August 2: Laura Boosinger and Kevin Hamlin, Masters of Ceremonies; Ed Herron; Grey Eagle (Stoney Creek Boys); Joe Penland; Dance Team: Cole Mountain Cloggers; The New Broad River Band; Clearwater Connection; Bearwallow; Dance Team: Green Valley Cloggers; Dance Team: Mountain Tradition Cloggers; The Ross Brothers; Laura Boosinger; The Griggs; Dance Team: J Creek Cloggers; Phil & Gaye Johnson. • Saturday, August 3: Richard Hurley and Glenn Bannerman, Masters of Ceremonies; Ed Herron; Grey Eagle (Stoney Creek Boys); Dance Team: Fines Creek Flatfooters; Trantham Family; Southern Highlanders; Dance Team: Stoney Creek Cloggers; The Cockman Family; Roger Howell; Dance Team: Bannerman Family & Friends; Dance Team: Southern Mountain Fire Cloggers; Bryce Parham & Kathryn Brickey; Appalachian Consort; Dance Team: Appalachian Mountaineers; Richard Hurley; Pinetop Revival. The Mountain Dance and Folk Festival is presented by Asheville’s Folk Heritage Committee which also produces its sister event, Shindig on the Green, a free gathering held each year at Pack Square Park on the Bascom Lamar Lunsford stage, with a stage show and informal jam sessions on Saturday evenings – June 29; July 6, 13, 20; August 10, 17, 24 and 31. Both events rely on the generosity and shared talent of the region’s finest old-time musicians and mountain dancers. The Folk Heritage Committee’s mission is to produce Shindig on the Green and the Mountain Dance and Folk Festival in order to support the preservation and continuation of the traditional music, dance and storytelling heritage of the Southern Appalachian Mountains. The Folk Heritage Committee produces the 47th Annual Shindig on the Green and the 86th annual Mountain Dance and Folk Festival with support from the following Corporate Sponsors: Able Rent-A-John; Acoustic Sound Production; Alan’s Jewelry & Pawn; Americare Pharmacy Consultants; Biltmore®; Brian C. Hunter, CPA, P.A. ; C.F. Martin & Co.; David Holt; Diane Bauknight, State Farm Agent; Elly Wells Marketing + Project Management; Fox Dental Associates; Graybeard Graphics; Grove Park Inn Resort & Spa; Harmony Motors; Henco Reprographics; Jack of Hearts Pub & Restaurant; Jack of the Wood; Laughing Seed Café; Lenoir-Rhyne University; Luella’s Bar-B-Que; Mangum Pottery; Mast General Store; Okie Dokies Smokehouse; Pack’s Tavern; Parsec Financial; RomanticAsheville.com Vacation Guide; Sam’s Club; Skyland Auto Group; Stevenson & Carney, Attorneys at Law; Stevenson Rare Coins & Jewelry; Timothy E. Gillespie, DMD, FAGD; and Tops For Shoes. Media Sponsors are: 880 AM The Revolution; 88.7 FM WNCW; 99.9 FM Kiss Country; The Laurel of Asheville; Mountain Xpress, News Radio 570 WWNC; Smoky Mountain Living; Smoky Mountain News; and WNC magazine. Ongoing support of Shindig on the Green is provided by the Asheville Area Chamber of Commerce, the City of Asheville, and Buncombe County. Ticket Information: Tickets (Regular $20; Children 12 and under $10; 3 night package $54) for the Mountain Dance and Folk Festival are available from the Diana Wortham Theatre box office: (828) 257-4530 or online at www.dwtheatre.com. For more information on the Mountain Dance and Folk Festival or Shindig on the Green, visit www.folkheritage.org or call the Folk Heritage Info Line: (828) 258-6101 x345. ASHEVILLE NC – Join us on a wild food adventure identifying fungi with Alan Muskat, philosoforager and stand-up mycomedian, who has been going “out to eat” for nearly 20 years. Author of Wild Mushrooms: A Taste of Enchantment, he has appeared on The Travel Channel’s Bizarre Foods, The History Channel, CBS, in The New Yorker and Southern Living. He founded the first wild foods market in North America and has sold hundreds of pounds a year (for almost 20 years) to more than fifty restaurants and hotels, including The Biltmore Estate and The Grove Park Inn. Learn more about Alan. Whet your appetite with an overview of edible and non-edible mushrooms. Then we’ll hike up to two hours along Park trails or “off the beaten path” looking for a dozen or two of the estimated 1,000 species of fungi that could be growing in the Park. Limited to 20 people. Cost: $25 for Adults, $10 for Annual Passholders (includes Park admission). Advance registration required. Chimney Rock at Chimney Rock State Park is one of the Southeast’s most iconic and popular international outdoor travel destinations and has been for more than 100 years. Known for its stunning 75-mile views overlooking Lake Lure, Chimney Rock’s unique hiking trails, guided rock climbing, live animal education programs and ancient geological features attract visitors from around the world. It’s the only state park in the Southeast with an elevator inside a mountain. Chimney Rock is located only 45 minutes southeast of Asheville on Highway 64/74A in Chimney Rock, N.C. Call (800) 277-9611 or go to chimneyrockpark.com to plan your visit. ASHEVILLE NC – Buncombe County Parks, Greenways & Recreation Services is offering one more session of swim lessons this summer. Swim Lessons are available for anyone age 3 and older. Lessons are divided into 5 levels of swim experience, plus a preschool level for swimmers ages 3 and 4. Preschool and Level 1 is a water acclimation class for beginner swimmers. Level 2 teaches swimmers to float on their back and use their arms and legs. Level 3 swimmers learn the front crawl and backstroke. Level 4 and 5 lessons are taught in the deep end of the pool. Students improve upon what they have learned and begin to work on sidestroke and diving. Registration for lessons is July 8. Sign up at the pool you plan to attend. Lesson availability is first come, first served. July 15 – 25 – Classes will be Monday – Thursday at 10 a.m., 11 a.m. and 6 p.m. Swim levels can be determined by speaking with the life guard on duty at the pool. The cost is $30 per person for a session of eight classes. You must register and pay at the pool at which you will be attending. For more information, call Teri Gentile at 684-5072, email her at [email protected], or contact the pool you will attend. ASHEVILLE NC – July 4 is designated as a free fishing day in North Carolina, meaning anyone – resident or non-resident – can fish for free in any public water, including coastal waters, without a license. All other fishing regulations, including length and daily possession limits, as well as bait and tackle restrictions, apply. To find a fishing spot near you, visit the Commission’s website for a list of more than 500 free fishing-access areas across the state. 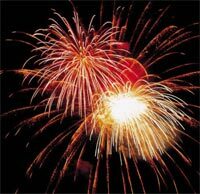 ASHEVILLE NC – On Thursday, July 4, Buncombe County Parks, Greenways and Recreation presents the Annual Fireworks Display at Lake Julian Park. Bring a lawn chair or blanket and join the fun. The fireworks display is one of the largest in the area and this year’s show promises to be the best yet. Fireworks start after dark but come early and enjoy your Buncombe County Park. Parking for the fireworks display is at Estes Elementary School across Long Shoals Road from the Lake Julian Park entrance. Be sure to wear comfortable walking shoes and bring a sweater or jacket. The evenings get cool at the lake. Remember, like all Buncombe County properties, Lake Julian Park is a Tobacco Free Facility. For information about this event, call David Blynt at (828) 684-0376 or email him at [email protected]. Fireworks will also be held on July 4 at the Big Ivy Community Center, Downtown Weaverville and Downtown Asheville. ASHEVILLE NC – Asheville city government offices will be closed Thursday, July 4 in observance of the Independence Day holiday. All City of Asheville Parks, Recreation and Cultural Arts recreation centers will be closed . The following specialized recreation facilities will be open: city parks, the Asheville Golf Course, Food Lion Skate Park , Aston Park Tennis Center, Recreation Park Pool, and the Western North Carolina Nature Center. For hours of operation and other information about the WNC Nature Center visit www.wncnaturecenter.com. College Street will be closed during the fireworks display scheduled to begin at 9:30 p.m.
· C – Louisiana – Haywood – State St. – Biltmore Village- Fairview Rd. – Swannanoa River Rd – Wood. Departs 9:00 a.m. – 5:45 p.m., operating on the same schedule as currently provided. · N1 – Merrimon – UNCA – Lakeshore. Departs 9:00 a.m. – 6:00 p.m., operating on the same schedule as currently provided. · N3 – Chamber – Hillcrest. Departs 9:40 a.m. – 6:40 p.m. Route will have a different departure time, leaving at :40 past the hour. · S3 – Asheland – McDowell- Biltmore Village- Hendersonville Rd – Airport. Departs 8:30 a.m. – 5:30 p.m., operating on the same schedule as currently provided. · S4 – S. French Broad – Depot – Livingston Heights- AB Tech. Departs 9:35 a.m. – 6:35 p.m., operating on the same schedule as currently provided. · E1 – Tunnel – Asheville Mall – Swannanoa River Rd. Departs 9:00 a.m. – 6:00 p.m., providing service as far as Wal-mart/Kohl’s, E1 will not serve the VA Hospital. · E2 –Asheville Mall – Haw Creek – Tunnel Rd. Departs 9:30 a.m. – 6:30 p.m., operating on the same schedule as currently provided. · W1 – Hilliard – Clingman – Haywood – PVA – Deaverview Area. Departs 9:00 a.m. – 6:00 p.m., operating on the same schedule as currently provided. · W3 – Patton – Goodwill. Departs 9:00 a.m. – 6:00 p.m., operating on the same schedule as currently provided. o use Patton Ave. to Broadway St. to Woodfin St./Oak St., both inbound and outbound. o resume their normal route starting with the bus stop on College St. @ South Charlotte St.
o serve the bus-stops on Broadway St. @ College St. and Broadway St. @ Walnut St.
2. College @ Court Plaza. For ART schedule information call (828)253-5691, e-mail [email protected] or visit www.ridetheart.com. Garbage and recycling collection schedules will continue as normal during the holiday. All public safety services, including police, fire and emergency response, will operate according to normal schedule – 24 hours a day, seven days a week. You are currently browsing the Asheville NC News blog archives for July, 2013.